The Oregon football team is already making good strides when it comes to the 2016 recruiting class. So far, the Ducks have five verbal commits for next year, and if things go well, possibly a sixth could join them soon. Andrew Nemec, of OregonLive, reports that four-star cornerback Jared Mayden will be taking an unofficial visit to Eugene the first weekend in April. According to ESPN, Mayden is listed as the No. 16 defensive back in the nation with more than 30 scholarship offers. The Texas native will also visit Alabama in April, and then will take a visit to Florida State this summer. 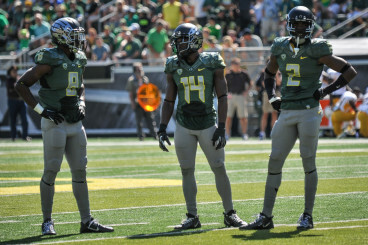 Reggie Daniels (8) with Tyree Robinson (2) and former Duck Ifo Ekpre-Olomu (14). Daniels and Robinson will likely be the future leaders of the secondary. 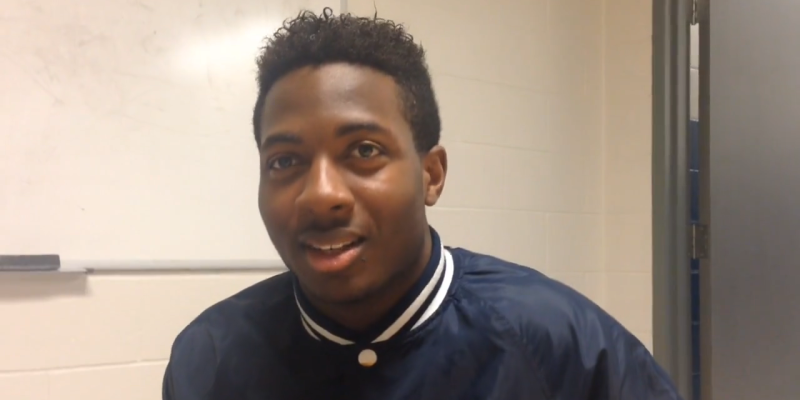 Mayden would be a key get for the Ducks in the 2016 class. Currently, Reggie Daniels is the only returning defensive back starter to return for this season. Chris Seisay, Tyree Robinson, Aaron Springs, Mattrell McGraw and incoming freshman Ugo Amadi join Daniels as the probable defensive back rotation next year; so the Ducks will need to sign some cornerbacks during the upcoming years to add depth at the position, and adding Mayden would be the first step in doing just that. With a defensive unit that had an excellent second half of the season last year (minus that national title game), Mayden could be a part of a much improved defense in the near future. Oklahoma, TCU, and Oregon were Mayden’s final three schools until he decided to re-open his recruitment a few weeks ago. When asked if there was a favorite, the recruit said, “Oregon is in the mix with the schools I would consider, but as far as them clearly being ahead of other schools, there really isn’t a leader.” If Oregon can wow Mayden before he takes his other visits, the Ducks could land the four-star defensive back when he makes his decision at The Opening in late July.